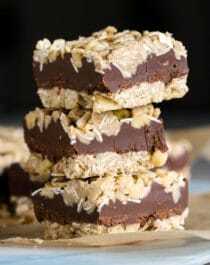 You’ve gotta try this super easy Oatmeal Fudge Bars recipe! It’s the perfect breakfast or midday treat to satisfy your sweet tooth — totally guilt-free. One bite and you’d never know it’s gluten free, dairy free, and vegan too! Best of all, these squares of rich chocolate and comforting oats are super easy to make and don’t require any baking whatsoever. All you need are eight simple ingredients, a few bowls, and a big appetite! 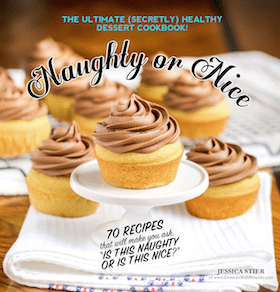 Thanks to Nuts.com for sponsoring this post, and thank YOU for supporting the brands that keep Desserts With Benefits going! All opinions are mine and mine alone. In the first bite, you are instantly hit with the intense dark chocolate flavor from the fudge filling. Then, you get the heartiness from the oats, crunch from the walnuts, and slight sweetness from the pure maple syrup. As the recipe’s base, I used a mixture of oat flour, oats, coconut oil, and walnut pieces from Nuts.com. I used a combo of both oat flour and oats because these are called “Oatmeal Fudge Bars” and I really wanted a pronounced oatmeal flavor. The oat flour acts just like regular flour and works as a great base ingredient to bind all of the ingredients together, while the oats provide a nice chewy texture. The walnuts add an uber rich, buttery flavor and some crunch to every bite. Then, the coconut oil and maple syrup help bind it all together, providing both flavor and natural sweetness. 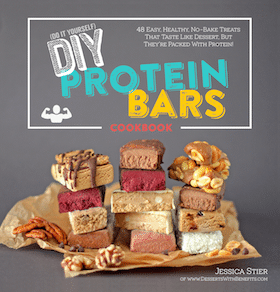 All of these ingredients together provide a ton of nutrition in these bars. We get healthy fats, whole grains, slow-digesting fiber, and low-glycemic sweetness (no sugar rush and sugar crashes here)! Next up, the filling — made with just 2 ingredients: chocolate chips and coconut milk! 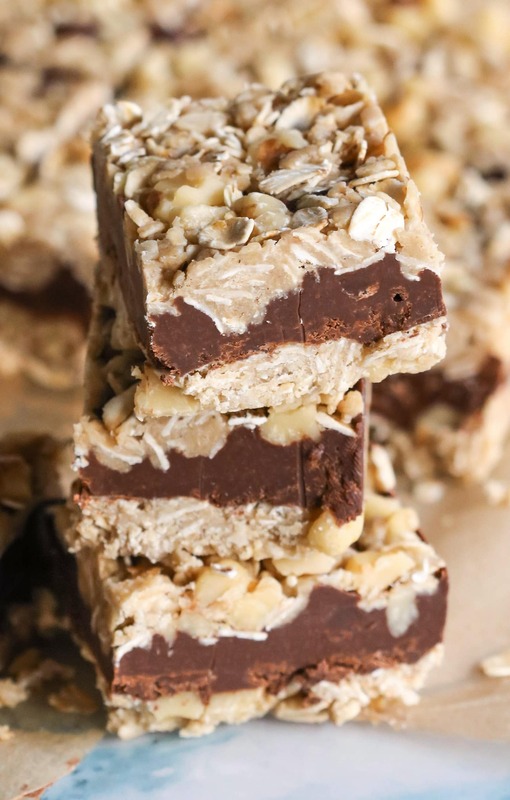 These Oatmeal Fudge Bars will surely be your new go-to healthy dessert recipe. 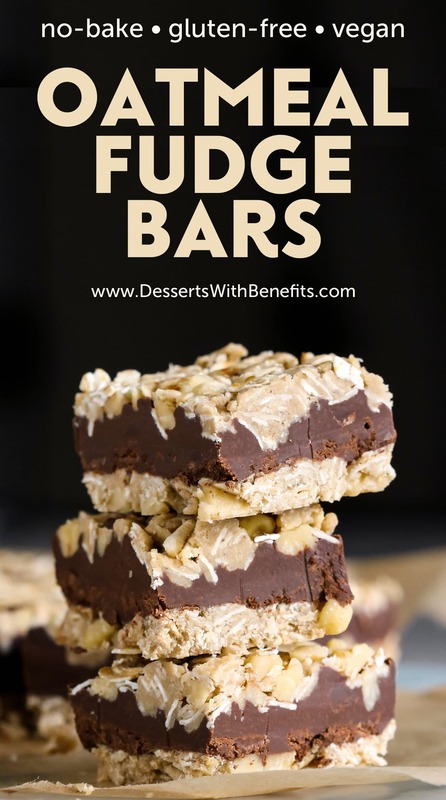 You gotta try this easy no-bake Oatmeal Fudge Bars recipe! It’s the perfect healthy breakfast or midday treat to satisfy your sweet tooth -- guilt-free! Spray an 8x8” brownie pan with cooking spray and line with parchment paper both ways for easy removal later. Fold in the walnuts pieces. Reserve 1⅓ cups of the mixture into a small bowl. Dump the remaining base mixture into the prepared pan and flatten it out. In a medium-sized microwave-safe bowl, add the chocolate chips. Microwave at 30-seconds intervals, stirring between each one, until completely melted. Whisk in the coconut milk. Mixture should thicken and turn into a smooth ganache. Spread the mixture over the base (I used an offset spatula). To the bowl with the reserved base mixture, stir in the remaining 2 tbs of oats. Sprinkle this over the chocolate layer and press it into the surface. Feel free to press in some more walnut pieces if you're craving some additional crunch! Cover and refrigerate overnight. Bring the bars out of the fridge 20 minutes before slicing to soften. Slice, serve, and enjoy! 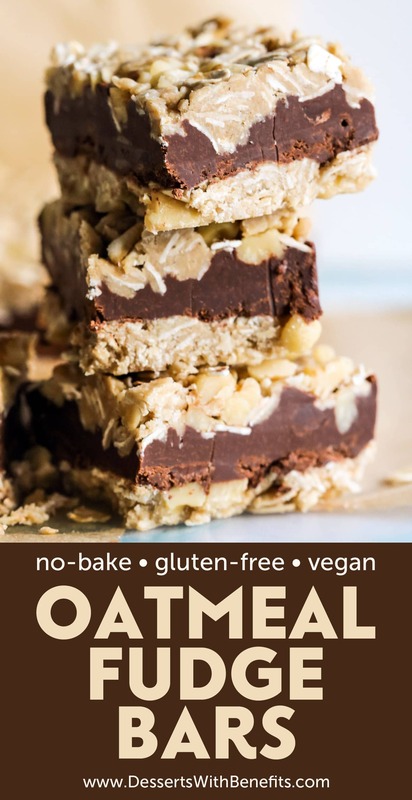 These delicious bars are soft, fudgy, sweet, and delicious, it’s hard to believe they’re gluten free, dairy free, vegan, and don’t require any baking. Perfect for the hot summer months ahead. And if you’re in Texas, like me, then these bars are perfect RIGHT NOW. It’s already so hot out, and I believe all next week the temperature will be in the triple digits. I don’t think I’ll be stepping near my oven for the next few months… I’ll be indulging in all the no-bake treats my heart can handle! It’s too bad that the nutrition information wasn’t provided. I plugged in the ingredients into a recipe calorie calculator (www.supertracker.usda.gov) and came up with about 250 calories per serving. The calculator has some shortcomings. It limited the cups of chocolate chips to TWO. It didn’t have 1/3 cup increments. If these calculations are incorrect, I would guess the actual calorie count is higher. These look very yummy! I would slather peanut butter RIGHT on top of each one or have a bar (or two, or three) with a side of soy milk ice cream! Just made these and they are YUMMY! I only let them set for about 6 hours in the fridge (does anyone actually wait overnight to try their awesome new fudge dessert?!) but they were already PERFECT and so satisfying. Hard and dense yet chewy and smooth. I wanted mine to have zero sugar, so I made a few substitutions: instead of maple syrup I used a combination of erythritol (both granular and confectioners), hemp milk, and a little bit of Pamela’s baking binder (potato starch + psyllium). Instead of the chocolate chips, I used a combination of 100% chocolate and erythritol, plus extra coconut milk to balance out the texture of the erythritol. I also used sunflower seeds instead of walnuts- just because they were all I had on hand, and I added a little maple extract to balance out to non-sweetness of sunflower seeds compared to walnuts. YAYAYAY! You have no idea how happy your comment just made me! Your subs sound great too (love the sunflower seeds). 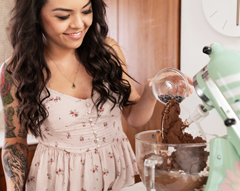 Have you tried Lily’s sugar-free chocolate chips? Next time I make these bars I’m gonna use those. But genius idea with the 100% cacao chocolate + erythritol!